While I was checking my personal email this morning (after my long vacation), I bumped into this one email in my Inbox – a news from Speaktoit Team. They are simply informing me that this virtual assistant application which became popular and one of the best Android application in the Android Market (now known as Google Play) have now entered the world of iOS – for iPhone, iPod Touch, and iPad. Well’ this news from the Speaktoit Team is not actually new because they’ve already announced and released the Speaktoit application on iOS last February 2012. 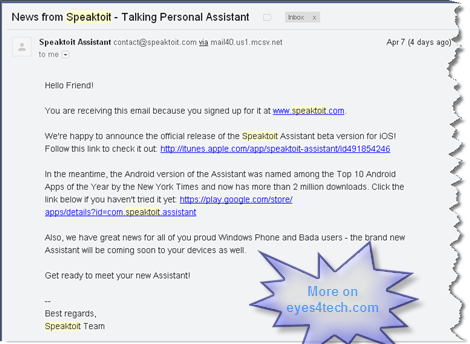 The part of the newsletter email sent to me which captured my attention is that the Speaktoit team is now developing the same Speaktoit Virtual Assistant application for Windows Phone and Bada users – now this one is new. I cannot say statistically that the Speaktoit virtual application for iOS is a complete success since most of the iOS 4.0 users have already migrated to iPhone 4S. But I think this virtual assistant application will give more value for those who haven’t migrated yet to iPhone 4S like those who have iPod Touch and iPad devices. And soon the Speaktoit virtual assistant will try conquer the Windows Phone and Bada world. The team shared and reported that they are now developing the same application to work on Windows Phone and Bada users. When will it be available for download? The answer for that is still indefinite but the good news is that they are working on it. Here’s the official newsletter from the team which I received. So for those who haven’t downloaded and tried Speaktoit Virtual Assistant for your device, here are the links. I will update this post once I get the news and download links from the Speaktoit Team.